NEW YORK, NEW YORK – AMERINGER | McENERY | YOHE is pleased to announce an exhibition of recent works from German born, Brooklyn based artist, Markus Linnenbrink. EVERYBODYWILLBEDANCINGIFWE’REDOINGITRIGHT will open on 4 September and remain on view through 4 October 2014. A public reception for the artist will be held on 4 September from 6:00 to 8:00 PM. A fully illustrated catalogue with an essay by Daniel Schreiber accompanies the exhibition. Markus Linnenbrink blends a myriad of pigments with epoxy resin to create his magnificent array of colors. The artist builds his paintings in layers on wooden panels. 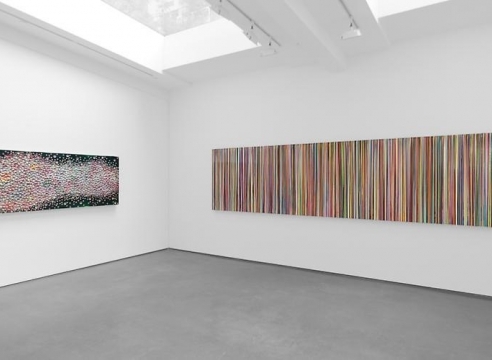 While the artist decides where colors begin at the top of the composition, the linear stripes are created by gravity, which pulls the paint down over photographs or watercolor backgrounds. His sculptural paintings involve stratas of colored resin, creating surfaces that are then drilled into, revealing clusters of archaeological-like craters. Linnenbrink’s approach to painting extends beyond a two-dimensional picture plane. His layered sculptures arrive in many forms: as the rectangular INTHEWORLDTODAY(PIMPMYRIDE), which was deliberately built and manipulated, and then as the more organically assembled AMGONE, a collection of paint material that simply drips off the works during the painting process into a form created by the weight of the material. 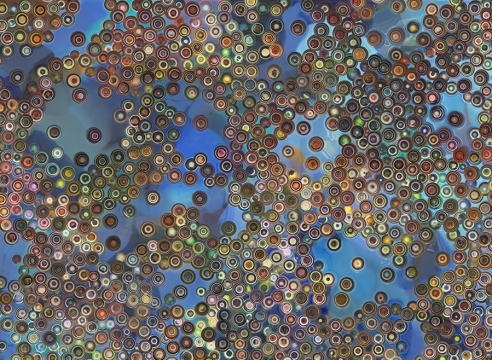 AMGONE is the product of three years of studio work and shows a memory of all the different colors used and layered on top of each other during this period of time. For this exhibition, Markus Linnenbrink has also created a site-specific painting installation, covering the walls, the floor, and the ceiling of one of the gallery rooms. The colors drip and splatter over one another, fully surrounding and immersing the viewer into a painting made out of iridescent stripes. Markus Linnenbrink was born in Germany in 1961. He attended Gesamthochschule in Kassel as well as the Academy of Fine Arts in Berlin. Recent exhibitions include “Off The Walls!” Kunsthalle Nüernberg, Germany; “PIMPMYRIDE”, a permanent wall painting for the Pennsylvania Academy of the Fine Arts, Philadelphia, PA; “day after day it appears” Patricia Sweetow Gallery, San Francisco, CA; “so here’s what you gonna do,” Taubert Contemporary, Berlin, Germany. His work is included in the permanent collections of The Hague Ministry of Culture, the Hague, Netherlands; Harvard Business School, Cambridge, MA; Harvard College, Cambridge, MA; the Hood Museum of Art, Dartmouth College, Hanover, NH; Museum Neue Galerie, Kassel, Germany; Pennsylvania Academy of the Fine Arts, Philadelphia, PA; the San Francisco Museum of Modern Art, San Francisco, CA; the San Jose Museum of Art, San Jose, CA; Hammer Museum, Los Angeles, CA; Wellesley College, Wellesley, MA; the Herzliya Museum of Art in Israel and the West Collection, Oaks, PA, among others.